Makoto Nakazono is a high school student with a small dark secret. Since he was little, he has had the mysterious power to see "black entities" that steal souls. One day, he is suddenly interrogated by one of the "black entities," Akira Seno: "Will you get in our way?" But Makoto replies with an air of resignation, "There's nothing I can do anyway, so I won't." There are two anime studios I can safely say I’m a huge fan of without any real caveats: Ghibli and Studio 4c. The former delivers for me more in terms of consistency, but the latter is by far my favorite in terms of how they use animation. As such, whilst a few of my more Studio Rikka-inclined colleagues were eagerly looking forward to Harmonie, I was more looking forward to Chronus. And I’ve got to say, whilst I don’t think it’s great overall, it delivered way better than the former did. 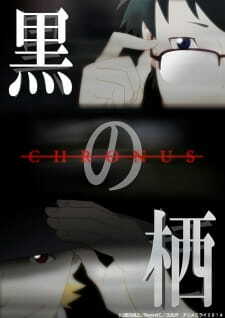 First off, I loved how the first half or so basically resembled Boogiepop Phantom or Serial Experiments Lain in terms of presentation in order to represent the main's powers regarding the supernatural. I love that sort of cryptic direction when it's done well, and Chronus pulls it off in a way that can be a bit heavy, but not to the point that I can't see what's going on. Said presentation disappears in the second half when the story goes more traditional and kind of action-y, but it's still kept visually interesting through the free-flowing animation and colorful visuals. Movement was pretty fluid and it delivered on visual intensity whenever it needed to. In short, this thing is pretty damn interesting, visual-wise. But is said visual style being applied to something worthy of it? Well, I think the story is pretty damn cool. A kid grows up with the ability to see soul-stealers, but he doesn’t do anything about it because he doesn’t see the point. But when said soul-stealers go after his female friend/crush, he realizes he has to take action. In essence, it’s a romance anime just like Harmonie was. However, this romance is between a girl who is about to die and a dude who’ll brave different dimensions and scythe-wielding specters in order to save her. In short, it’s a romance anime where cool stuff actually happens rather than one where you just blab about said cool stuff like you’re in a typical VN adaptation and proceed to do nothing but weakly tie it together with the most basic of plot elements. When you tie it all in with the awesome visual style and a pretty damn cool ambiguous ending to the thing that leaves me wanting more, you know you’ve got something worth watching. Yeah, this looks to be my favorite of the Anime Mirai stuff this year. Unless A-1 gained talent just for their contribution or something. When I read this, I thought it was just going to be another Bleach rip off, what I wasn't expecting was that I would really enjoy this short movie and watch it multiple times. This is my first Review be nice. The reason I'm giving the art such a low number is because I've seen Art style like this in multiple movies and it's getting old, but what can you do? The story was very interesting but like I said I thought it was going to be another Bleach like story. But they turned it around by him not being able to actually attack the Grim Reapers, all he could do is talk to them. The sound was amazing, everything was in Sync, The voice acting was very outstanding I actually thought I was there in the movie. The Character Makoto Nakazono was a very out going and depressing type Character. Their isn't really any Character Development because it's 26 minutes long, but I still liked his Character. I really enjoyed this movie, I was on the edge of my seat the whole time and no Anime movie has done that for years. Overall I really liked this Short Movie, and I would recommend it to anyone. Also it may be very sad for you at times, I teared up once and that's it. Kyro no sumika: chronus has a somewhat more minimalistic but fluent animation(I do not mind more minimalistic animation) but what it lacks in details it compensates with the use of effects, POV, camera motion and especially the sound effect. - It presented enough detail to understand the setting but still left enough out to wanting to explore more. - Even though characters had classic personalities there were still character development. The story on the other hand wasn´t original but quite predictable but how it was presented the effects, the concept of the reapers and the asked questions made it interesting. To love is Nothing. To be loved is Something. To love and be loved is Everything. The magic of first love is our ignorance that it can ever end. If two people are meant for each other, it doesn’t mean they have to be together right now or as soon as possible, but they will eventually. Loving the wrong person doesn't mean you're stupid, It was of that person not to appreciate your love. One can not truly experience the beauty of love without enduring the pain that comes with it once it is lost. A truly great romance series I’ve watch for movie type. Even though the series is short, with duration 25 minutes, the character development play it role with simple outstanding performance. I’ll give it 9.8 / 10 for it. It’s not cliché and even I don’t expect too much from the movie. But, what I get is this feels satisfied overall and worth to watching it. Weird isn’t it? The series only have one episode yet it can give me the feel of satisfied. Let me clear this, I am really tough person to admit any anime series is really great unless if it’s true in my own perspective. A story about high school student named Makoto Nakazono who had abilities to see Grim Reaper or people who can take the life of others. He seen many people life has been taken of around him. His abilities freak people out since he can see this ‘black entities’ since kindergarten. Thus, he chooses to shut himself up until the black entities next target is none other than his childhood friends named Hazuki Horiuchi. Now his adventure to save his childhood friends will slowly begin. A story with hardship to seek the true love. The art and animation for this series is ordinary and pretty typical. I’ve seen worse than this so I can enjoy the art. It’s not that worse. The anime is your usual type of art animation. Don’t let it gets you, I know 2015 have many anime with a really great art and animation but this one still great despite it miss out one year. The ending is quite catchy but not really memorable. Also this anime doesn't have ops. But the ending is not bad. Better check it out when you're finishing the anime. I love it. You sure play it right man. Don’t let others people steal your loved one. I wish I can be like the main character. Act first before regret. To think I could learn something from this series, haha you’re a great one. You just made my day. Who’s awesome? You’re awesome! I just kind of enjoy this series to my full heart content. The series have great storyline with no real flaws. Not like some anime that have so many episodes but dumb slow and failed at character development until the end of the series. So, if you’re looking for anime that can satisfied the urge to watch a great story. You've got it. In all honesty, you need to see this for yourself.